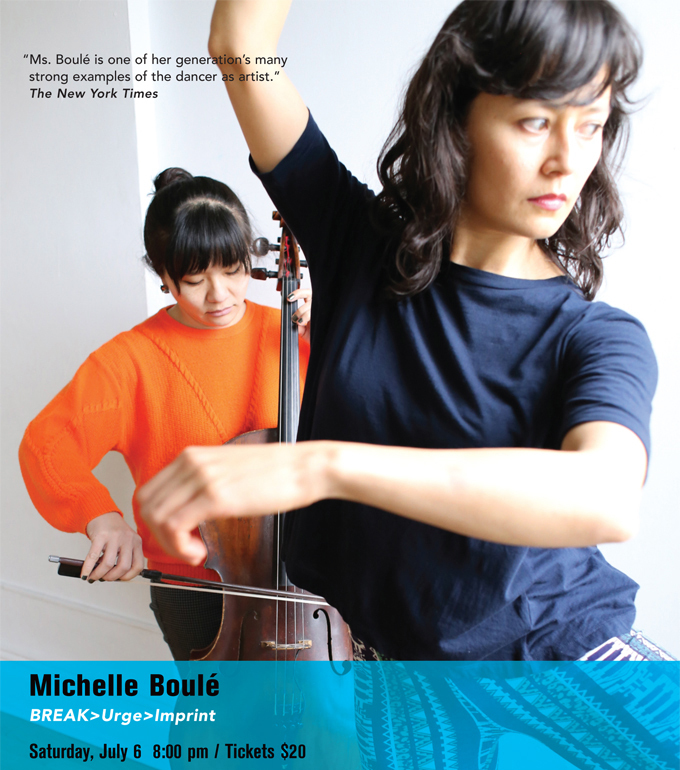 BREAK>Urge>Imprint is a collaborative performance by dancer Michelle Boulé and cellist Okkyung Lee. Connected by their absolute and articulate physicality, Boulé and Lee push to the edge of sonic and choreographic boundaries into an atmospheric and sculptural consciousness. Through the vehicle of improvisation, they gradually penetrate and map a space where perception of form shifts, and a new dimension of performance opens. In addition, Boulé presents a new duet for herself and dancer Lindsay Clark, with sound by Okkyung Lee. Exploring the banality and intricacies of everyday movements, this work in progress reframes this unspoken vocabulary with meaning, perspective, humor, and understanding. Michelle Boulé is a Bessie Award-winning performer, choreographer, and teacher based in New York. She is a 2012-14 NY Movement Research Artist-in-Residence. Okkyung Lee incorporates jazz, sounds, Korean traditional music, and noise with extended techniques to create her unique blend of music. She is the recipient of a Foundation for Contemporary Arts grant (2010). This project (New Duet: White) was made possible, in part, through The Movement Research Artist-in-Residence Program, funded, in part, by the Mertz Gilmore Foundation and the Davis/Dauray Family Fund. BREAK>Urge>Imprint was made possible with funding from the Foundation for Contemporary Arts Emergency Grants Program.